The end of the rainbow…….. In honor of St Patrick’s Day, I thought I would share my rainbow story. As a child we all learn stories of leprechauns, four-leaf clovers, and the pot of gold at the end of the rainbow. I am not Irish, though I long to be, and deep down believe that there must be a dollop of Irish blood in my ancestry. Always fascinated by things Irish, I was keenly aware that the pot of gold at the end of the rainbow was a fairy tale. 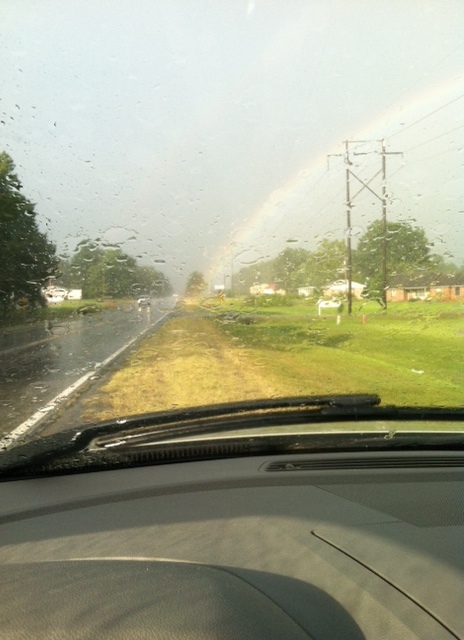 Until I was driving home during one of those rain showers in Arkansas that is brightened by sunshine, that is. The weather was ripe for a rainbow, and I soon observed one, its rays of color particularly clear and distinct. There was almost the promise of another bow as faint fragments of color tried to come together just to the left of the first one. Following the rainbow’s colors with my eyes, I was surprised to see that the arc appeared to touch the ground on the roadside ahead, and, thereby, began to understand where the pot of gold legend originated. The sun and the rain had partnered together to create the illusion of a glowing golden something resting roadside. I caught my breath and quickly pulled onto the shoulder to preserve the moment with an I-phone image. I was in awe as I grasped the fact that others had surely viewed the same phenomenon in years long past and places far away and, thus, the legend of the pot of gold was born. Of course, sadly, as I pulled back into the traffic and approached rainbow’s end, both rainbow and optical illusion faded away. But the episode inserted itself into my consciousness, and I found myself trying to find some meaning in it. My first thought was that the pot of gold, since I “found” it on my way home from work, represented the blessing of home. Then I pondered the emotion that the moment had inspired. Rainbows have always seemed a happy surprise in a rainy day to me, but how disappointing they must be for those who are defeated each time they try to lay hands on that proverbial pot of gold. In the leprechaun’s tales, the pot of gold is just that, literally a pot (usually golden in color) filled with gold coins. But perhaps the pot of gold is something different for each of us. For me, that rainy day after a long day at work, home was my heart’s desire. There are days now when my pot of gold is a family member’s health or getting published or having some free time just for me. Another might long for the safe delivery of healthy infants after a complicated pregnancy. Still others might dream of finding that special someone that completes one in a happy marriage. One might long to win millions in the lottery, while another might long for just enough to put food on the table and pay the bills. Maybe it is being accepted to the right college or the best graduate program. Perhaps it is a husband finding the perfect job. Mothers and fathers long for health, happiness, faith, and success for children (and grandchildren). Siblings might pine for restoration of a relationship. I have come to believe that these longings of the heart are intrinsically more valuable that any literal pot of gold. Rainbows are beautiful. But even more beautiful is knowing the Creator of rainbows and all things good. Have a blessed and happy St. Patrick’s Day! Next postWhen the earth gives way……..
Love how your meditations brought you back to our God. Fortunately, they generally do! Thank you for your comment…..